IN THE two decades since that afternoon on June 2, 1995, when BSP chief Mayawati and her MLAs were confined to a guesthouse in Lucknow by the Samajwadi Party led by Mulayam Singh Yadav, every talk of an alliance of any form between the two has run up against the memory of those three hours. As Mayawati shows willingness now to take a leap of faith, as Akhilesh Yadav promises a new SP, and as the Uttar Pradesh bypoll results give the two parties and others waiting in the wings fresh wind; it may not prove the only one. This isn’t the first time since the 1995 incident that the SP has made overtures to the BSP. Mayawati has, however, never reciprocated. What is different this time is the realisation that pooling together of resources may be the only way they can hold off the BJP. In the last two elections, 2014 Lok Sabha and 2017 Assembly, the BJP has held complete sway over UP. Mayawati has now been out of power for six years in UP (from three-fourth of the seats in 2007), and has a shrinking footprint in the rest of the country. The SP, a party confined to largely UP, saw a fall to 47 seats in the 2017 Assembly elections from 224 five years ago. And yet, the two parties are no pushovers in UP, with Mayawati winning 22.23 per cent of the votes even in 2017, and the SP 28.32 per cent. Together, that is just over half of the votes polled in the state, as compared to the BJP’s 41.57 per cent vote share. In the 2014 Lok Sabha polls too, at the height of the Modi wave, though the BJP got 42.63 per cent of the votes, the combined vote share of the SP (22.35 per cent) and BSP (19.77 per cent) was only fractionally behind. The potential of the arithmetic is appealing to both. An analysis of constituency-wise data of the 2017 election shows that the BJP may lose as many as 50 Lok Sabha seats in UP should the SP and BSP votes be combined in 2019. Such a combine might get at least 57 of the 80 seats in the state; the BJP only 23. Sources said the two parties started considering an alliance soon after the 2017 Assembly results. The doubts that remained were settled with the BJP recording wins in the Northeast, subsuming smaller parties in its march. Mayawati and SP president Akhilesh Yadav talked over the phone, followed by the announcement that the BSP would support the SP in the by-polls. Since then, Akhilesh has hinted at more such “ekta (unity)”, though Mayawati remains characteristically reticent. The SP understands the reason for the silence. The two bypolls perhaps offered the easiest beginning for this possible alliance. Mayawati famously never contests by-elections, and would have had no trouble in letting the SP take the lead. Should the two decide to expand the tie-up to all of the state’s 80 Lok Sabha constituencies in 2019, it will come down to how they work out the seat-sharing. Mayawati has made it very clear that on this would hinge her decision. In August 2017, rejecting the RJD’s invitation for a joint ‘BJP Bhagao, Desh Bachao’ rally in Patna, she had said the BSP would not share the stage with any party until the contours of an alliance between them and a seat-sharing formula for the 2019 polls was finalised. “The BSP supports a secular coalition and joint struggle… but the division of seats among parties should be decided first… Coalitions end because of discord over seat-sharing,” Mayawati had said, adding that the BSP would “never compromise on getting a respectable number of seats”. While BSP Rajya Sabha MP Munqad Ali says it is too early to speak about an alliance or its modalities, The Indian Express reported on Friday that a broad agreement had been reached between the SP and BSP to contest an equal number of seats in 2019 in UP. Another conflict could arise on the issue of accommodating the Congress, an SP ally, which was reduced to just 6.25 per cent vote share in UP in 2017. The Rashtriya Lok Dal (that has a base in Jat-dominated western UP) and Peace Party, that have held public meetings with Akhilesh, may also be contenders for seats as part of a grand alliance. But Mayawati has always been reluctant to ally with the Congress, which lays historical claim to the Dalit vote. As an example of what could go wrong, the parties don’t have to look far. During the 2017 Assembly elections, the announcement of the SP-Congress alliance had got delayed as Akhilesh and Rahul Gandhi took a long time deciding the seats. Then, even as the talks were on, Akhilesh declared candidates on 191 of the 403 seats, including eight constituencies where the Congress had sitting MLAs. Reports said the SP was not ready to give more than 85 seats to the Congress. Eventually, a formula of 298 seats for the SP and 105 for the Congress was worked out, but with both parties ending up with candidates on some seats. Ultimately, the Congress contested on 114 seats and the SP on 311; winning seven seats and 47 respectively. The number of seats left for the Congress was seen as one of the factors for the SP’s poor performance. But even then, the numbers showed that the SP and Congress had both gained in terms of vote share. In the 2012 polls, the Congress had got 11.65 per cent of the votes on the 355 seats it contested. In 2017, even when contesting in one-third of the constituencies — 114 — it got 22.09 per cent of the votes. The SP had contested 401 seats in 2012 and got 29.29 per cent of the votes. It got 21.82 per cent of the total votes when it fielded candidates on only 311 seats in 2017. Any alliance with the BSP would be even more beneficial for the SP as Mayawati’s party has time and again shown its capability to transfer its votes to partners. The BSP and SP also form a more homogenous vote base. This transfer of votes was evident in the Gorakhpur and Phulpur bypolls. 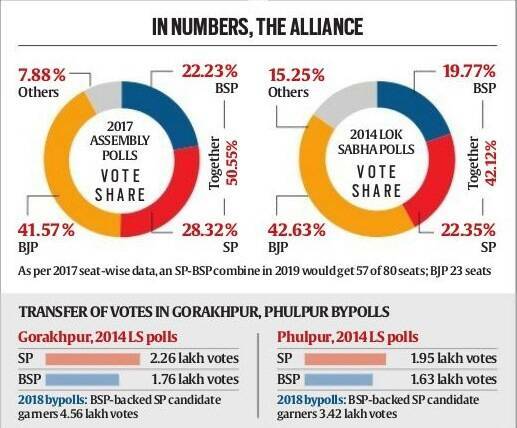 In the 2014 Lok Sabha polls, the SP got 2.26 lakh votes and the BSP 1.76 lakh votes in Gorakhpur (a total of 4.02 lakh); while in Phulpur, their share was 1.95 lakh votes and 1.63 lakh votes respectively (total 3.58 lakh). In the 2018 by-elections, the BSP-supported SP got 4.56 lakh votes in Gorakhpur and 3.42 lakh votes in Phulpur. SP MLA Sunil Yadav insists any SP-BSP tie-up would not face the problems the SP-Congress’s did, where leaders at the top decided while there was confusion on the ground. “This time, the ground-level workers and voters of both the parties have come together,” the MLA says. Another SP leader admits it won’t be as easy, with the possibility of rebellion as ticket seekers of the two parties may contend for the same seats. “They have all become empowered in the past 15 years. This is not like 1993 (when the SP, BSP last had an alliance), when both parties had leaders from ordinary backgrounds,” the SP leader says. Any talks with the BSP would also have to be concluded well ahead of the 2019 elections as Mayawati prefers announcing candidates much before polls to prepare at the ground level. Party sources say she has already held several meetings with BSP leaders, starting last year. In seat-sharing, the parties generally go with the formula of retaining the constituencies where they last won, and looking at who came in second in the rest. If 2014 is to be the benchmark for 2019, Mayawati would have to drive a hard bargain. Amid the Modi wave, while the BJP and allies took 73 of 80 seats, the SP got five (all with Mulayam and family members as candidates), the Congress two (Sonia and Rahul Gandhi’s constituencies), and the BSP none. But a look at who came second shows that the BSP was runner-up in 34 seats, and the SP in 31. The Congress in six. In the next slot, the BSP came in third in 42 seats, and the SP in 30. In the most high-profile seat of Varanasi, from where Prime Minister Narendra Modi was elected, the runner-up was Aam Aadmi Party chief Arvind Kejriwal, but the BSP finished ahead of the SP. Overall, the BSP polled 19.77 per cent of the votes, against the SP’s 22.35 per cent and the Congress’s 7.53 per cent. The calculations could also go for a toss as the BJP works out its numbers. This ganging up against it could help the party polarise the non-Yadav OBC and non-Jatav Dalit voters in its favour. Besides, the BJP can’t be written off when it comes to Dalit votes. In 2014, the BJP won all the 17 reserved seats in the state by huge margins. In 2009, the SP had won 10 of the reserved seats, followed by the BSP’s, Congress’s and BJP’s tally of two each, and the RLD’s one. The BJP would also go after Muslim candidates fielded by the Opposition (in the 2014 Lok Sabha polls, the BJP didn’t field any). The Congress clearly knows the dangers of such polarisation, having gone out of its way to avoid this in the Gujarat Assembly elections. The SP, on the other hand, can be expected to aggressively woo its Muslim base. In that too, the tussle with the BSP could be interesting. In the 2014 polls, the BSP fielded 19 Muslim candidates as against the SP’s 14. While none won, in seats where both the SP and BSP fielded Muslim candidates, the SP nominees polled more votes, like in Kairana, Moradabad, Rampur, Sambhal and Amroha. In the 2017 Assembly polls too, Mayawati had attempted to forge a statewide Dalit-Muslim combine by giving tickets to 100 Muslims, but only five won. The SP fielded around 61 Muslims, of whom 14 won. A BSP leader says the party leadership believes that its past association with the BJP had made a section of the Muslim voters wary of it. “We hope that by joining hands again with the SP, we can remove that stigma,” the leader says. In going ahead with the alliance, Akhilesh could face a challenge from within his family too. Mulayam had openly opposed his son’s decision to ally with the Congress in 2017, distancing himself from the campaign and affecting the SP’s performance to some extent. After the SP was voted out of power, Mulayam had held the decision to ally with the Congress as a reason for the rout. Mulayam has kept his silence this time, through the announcement of the tie-up for the bypolls, and even after the results. But an SP leader admits they anticipate a problem. “Reservations are expected from his side because he cannot forget that Mayawati had withdrawn support to his government in 1995 (it led to the guesthouse incident),” he says. SP spokesperson Ghanshyam Tiwari says they are taking it one step at a time. Of which the next one could be the Kairana Lok Sabha bypoll. It was won by the BJP last time, when both the SP and BSP fielded Muslim candidates. And right now, from Andhra Pradesh to J&K, and West Bengal to Gujarat, they can sense a rumble.